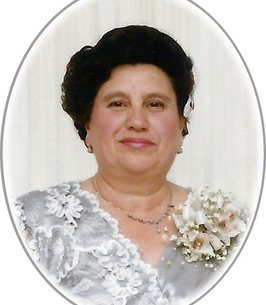 With sadness, we announce the passing of Antonietta on September 11, 2018 at Humber River Hospital at the age of 83. Beloved wife for 55 years to Gabriele and cherished mother of Marisa (Stewart Maclean) and Renato (Kristy). Proud nonna of Jacqueline, Steven, Alessia, and Victoria. Predeceased by her brothers Mario and Egidio, she will be missed by her siblings Giuseppe, Rita, Gabriele, and Irene and their families. Visitations will be held at Bernardo Funeral Home (2960 Dufferin St., south of Lawrence Ave. W.) on Sunday from 2-4, 6-8 p.m. Funeral Mass will be celebrated in St. Charles Borromeo Church (811 Lawrence Ave. W., at Dufferin St.) on Monday, September 17, 2018 at 10:00 a.m. Entombment will follow at Westminster Cemetery (5830 Bathurst St., north of Finch Ave. W.). In memory of Antonietta, donations may be made to either the Canadian Diabetes Association, Canadian Cancer Society, or Humber River Hospital Foundation. To plant a tree in memory of Antonietta Ranalli (Mazza), please visit our Heartfelt Sympathies Store. We will miss this lovely lady. We are so sorry to hear of the loss of your mother. We remember her with this donation and we think of you with love.